On Tuesday our resident artist, Poppy Luca, brought paints and fabric, and the children set to work drawing and painting whimsical creatures for making their own stuffed animals and dolls. Pono transformed into a magical toy workshop as the children’s imaginative ideas took shape. The children were abuzz on Thursday as we met with local beekeeper, Korin Krossber, in the 124th Street Community Garden. Korin dressed in full beekeeper “costume” and showed us different frames from her hive to help us understand how nectar becomes honey. We even got to see baby bees! Korin gave us wax to take back to Pono and happily obliged when our littlest Pono friends asked her to help them water our plot in the garden. This term we learned firsthand about the lifecycle of butterflies. We observed tiny caterpillars grow and spin chrysalises and then emerge as beautiful Painted Lady butterflies. The time had come to set them free, so after our visit with Korin, Sulaf announced, “With heavy hearts we say a great farewell to our best friends, the Painted Ladies.” The children cheered and counted each butterfly as it flew away into the garden. One butterfly stayed in the net, reluctant to leave its Pono friends! Coconut yogurt parfaits were on the menu in Math and Cooking this week, but the recipe involved a roll of the dice. After the children layered coconut yogurt and granola, they rolled “double dice” (a small die inside a larger translucent die) and added up the numbers with Maysaa and Kate to determine how many pomegranate seeds they would get to sprinkle on their parfaits. It’s no surprise the children were happy to keep on rolling their dice! On Thursday Olivia introduced her Pono friends to the Land Down Under. She had chosen images of city and country life, as well as a selection of native flora and fauna to show the beauty of this unique environment. The children especially enjoyed learning about marsupials. Another topic that generated fascination was Bush Tucker, wild native foods including such delicacies as Kakadu Plum, Honey Ants and Wichetty Grubs! The class concluded with everyone creating their own dot painting based on traditional sand drawing. The littlest Pono friends made “funny food faces” with Maysaa and Moa’s mom, Nicole. The faces featured blueberry eyes, shredded cheese hair, cucumber ears, and big red pepper smiles. Some of the children ate their creations and others fed theirs to our turtles! Bison and elk and bears, oh my! On Wednesday we made our way to the Queens Zoo, where our guide Theo showed us wildlife of the Americas, from American bison to Chacoan peccaries to Andean Bears. We even peered through the trees and spotted a tiny deer called a pudu. We ate lunch near grazing Roosevelt elk and then passed by alligators lounging in the sun before heading to the zoo’s farm to visit the domestic animals. Theo gave the children pellets to feed to the sheep and goats, and we couldn’t tell who was having more fun, the children handing out the food or the animals gobbling up treats! This week, the children worked with Poppy Luca on comic art, mainly through examining the work of Sean Tan. Poppy showed select pages from Sean Tan’s The Arrival and the companion book The Making of the Arrival and talked about how a drawing does not start off “finished”, and how drawings can change as they are made manifest on the paper. They discussed Tan’s creative process; introducing the children to the process of moving from an initial quick sketch of an idea, then developing it using collage and staged photographs, and then working it all into a more detailed and polished drawing. They also talked about how each window of a comic can have different levels of detail and “labour” and how that can be used for effect or to communicate the story without words. This past Saturday, June 6th, was our Community Fun Day. 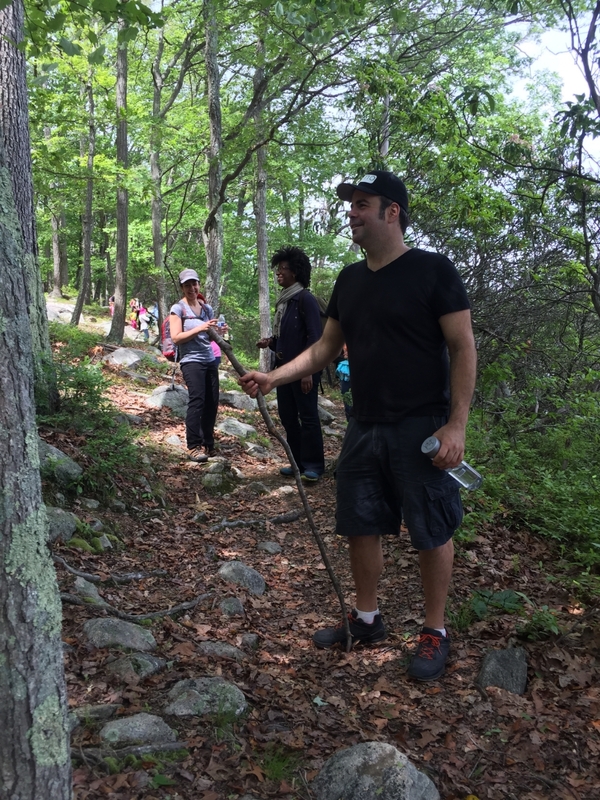 We explored beautiful Harriman State Park and enjoyed delicious food, thank you George (Bodi's dad)!